The ultimate confidence-builder! It's time to learn Scottish Gaelic. 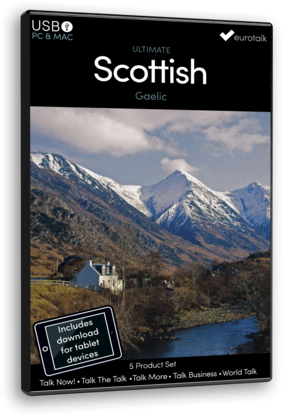 When you’ve completed this set of programs, you’ll be able to speak Scottish Gaelic with accuracy and conviction. The Ultimate Set also includes a companion app for your tablet, so you can learn on the move. Hours and hours of language content, all designed to get you learning through games and practice. It's easy to be fazed when you start a conversation in Scottish Gaelic and the person you’re talking to replies using lots of words that you haven’t learned yet. World Talk prepares you for these real-life situations with addictive listening games. It will teach you to recognise key words in everyday situations and broaden your vocabulary.